We have reserved a block of rooms at Yinghua Hotel (Cherry Blossom Hotel, 樱花宾馆 ) for the participants. (Except for those invited guests, participants are expected to cover their own travel and accommodation expenses. If you want to apply for a subsidy, please send us an e-mail. The hotel is very close to the campus of the University of International Business and Economics. 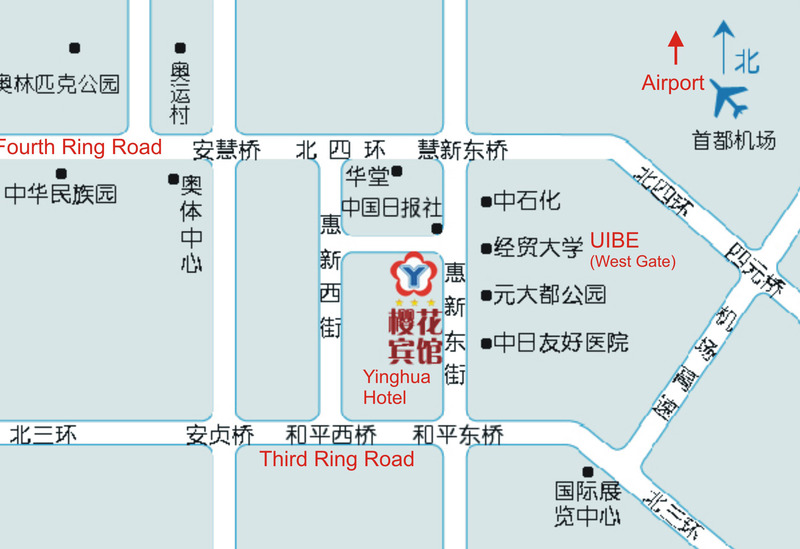 (The University and the hotel are located between the North 3rd Ring Road and the North 4th Ring Road of Beijing.) http://www.yinghuahotel.com. Tel: +86 10-64934455. See the map below. The conference rate per standard room per night is 300 yuans (app. 44 USD), which includes a breakfast. date (and possibly approximate time) of arrival and that of departure. You will pay for your room at the time of checking-in or checking-out. This page was last modified on November 23, 2010. Comments are most welcome and can be sent to webmaster.